One sunny morning in October of 2012, I crossed the Ravenel Bridge from Charleston into Mt. Pleasant, and I kept driving until I reached the banks of Jeremy Creek in the village of McClellanville. I had traveled there to meet with Selden “Bud” Hill, director of McClellanville’s Village Museum, and Michael Prevost, president of White Oak Forestry and board member of Drayton Hall Preservation Trust. Bud and Mike had told me that they were interested in getting a 6.6-mile portion of a nearby road—the Old Georgetown Road, often referred to as the King’s Highway—listed on the National Register of Historic Places as a means of preserving the road in perpetuity. This was in the suggestion of none other than Drayton Hall’s executive director George McDaniel, who had met with Mike and Bud to discuss the road’s preservation the year before. Then we hopped in Mike’s Ford F250. We headed west, out of the village of McClellanville, and north on Highway 17. We turned off on Rutledge Road and traveled for about a mile before we turned left onto a lonely dirt road, surrounded only by the forest. This was it. This was the Old Georgetown Road. Standing in the ancient church only enhanced the sense of timelessness I felt. Often called the Brick Church at Wambaw, it is built in the Georgian style with pedimented porticos supported by four round columns of brick and offering tall wooden box pews in the interior. It is sparsely beautiful, and its architecture, craftsmanship and state of preservation seem to beckon stories from centuries past to come forth and mingle with the present. What makes the Old Georgetown Road even more remarkable than its historical appearance is that this 6.6-mile section of the Old Georgetown Road is one of the last and longest continuously unpaved public portions of the 1,300-mile pre-Revolutionary road that connected Charleston, South Carolina to Boston, Massachusetts (Dollarhide, 1997, 1). As local resident David Doar recounted in his 1907 Sketch of the Agricultural Society of St. James, Santee, “From the earliest of times until the railroad was established the road running through the Parish formed one of the links which made the most direct route of travel from Charleston to the North, then our people were in the world, for all who were bound to the most settled part of the United States had to pass this way” (Doar, 1907, 26). The first to “pass this way” were the Sewee Indians. Your mind’s eye doesn’t need much convincing to narrow the road and transform it into the Sewee’s Broad path. There you can see the Sewee laden with goods they had derived from the deer and bear they had hunted—from skins to fishing line and glue—would trade with the tribes like Kiawah, Stono, Edisto, Ashepoo, Combahee, Wimbee, Coosa, and Santee to the north and west. (Miles 2004, 10). No bears to fear (or hunt) today, but walk no more than ten feet and your steps can become as slow and deliberate as the British explorer and naturalist John Lawson’s as he journeyed throughout the region in 1701 learning from the Sewee and the new French Huguenot settlers, most of whom Lawson notes, “follow a Trade with the Indians, living very conveniently for that Interest” (Lawson, 1709, 12). Despite the vast wilderness he encountered on his travels, Lawson still referred to the Old Georgetown Road—then, in 1701!—as “the Road from Charles-Town, and the rest of the English Settlement”. Even in these early colonial days, the road was more of a highway that connected all of the English colonies than the sandy path it appeared to be. About a third of the way along the road, south of Rutledge Road, is Jones Pond (which is not a pond at all). It is one of South Carolina’s unique Carolina Bays, an unexplained, isolated wetland. Here the sun, clouds, fresh water, and cypress limbs are tangled together, the line between reality and reflection hard to determine. Jones Pond is at once peaceful and a little spooky, and no doubt part of British General Banastre Tarleton’s inspiration for the nickname he gave to General Francis Marion, the “Swampfox.” Look closely at the clumps of marsh grass and cypress, and Marion appears, crouching behind them ordering General Peter Horry to “move to Wambaw, where forage can be had….as your new position at Wambaw will be more secure, your men will not be so much harassed. I wrote to you in my last that no boats or persons should pass from or to Charles Town without you or my passport.” In Carolina Bays like this one, Marion hid and protected his men, all while ensuring that the only route to Charleston—the Old Georgetown Road—remained blocked to the British. Of course, travelers from Drayton Hall no doubt “passed this way” too. While researchers have not found documentation, if William Henry Drayton, John Drayton’s oldest son, travelled overland to Philadelphia after being elected to serve in the Continental Congress in 1778, he would have taken this route. Just ten years prior, a British surveyor had described the road as “very good, but sandy in a few places” and no doubt that same streetscape would have greeted William Henry Drayton. Along with him might have traveled his young, inquisitive, and very bright son, John, born in 1766, who attended school in New Jersey while William was serving the nation in Philadelphia. Would he have enjoyed stopping at the taverns along the way or feeling the water under his feet as they ferried across the South and then the North Santee? Later, John would become a regular traveler along the road. He and his wife Hester Rose Tidyman owned Hopeland plantation, located on Memim Creek, a tributary of the North Santee River. John served as governor three times, and as governor’s duties demanded, he would have journeyed south along the road to travel to Charleston and Columbia. In his internationally acclaimed book, A View of South Carolina, as Respects Her Natural and Civil Concerns, and in his Carolinian Florist, this astute observer and writer described the flora, fauna, and agricultural practices one would have seen in the region. William Henry Drayton’s niece, Charlotte Drayton Manigault, surely traveled along the Old Georgetown Road “to the North” in the 18th and 19th centuries too. Charlotte was the daughter of Charles Drayton, third owner of Drayton Hall, and she married Joseph Manigault. While they lived “in the city” at the house known today as the Joseph Manigault House (owned and operated by the Charleston Museum), they also owned a plantation called White Oak on the north bank of the North Santee River and not far from her cousin, Gov. John Drayton. Perhaps her father, Charles Drayton, headed north to visit her from Drayton Hall on occasion. Maybe the extended Drayton family came together at St. James, Santee Episcopal Church. Their travels would not have been solitary for with them would probably have been their slaves, serving as carriage drivers, footmen, or grooms for the horses, and who might have used the trip to bring news back to the enslaved community at Drayton Hall. The Draytons’ use of the road seems even more certain when you consider who else chose to journey down it in 1791. Indeed, the nation’s first president George Washington selected the road as part of his “Tour of the Southern States.” According to his biographers, Washington was a meticulous planner: one biographer writes, “he had mapped the route, calculated the mileage, estimated the rate of progress, and planned the length of his stop at each town” (Lipsomb, 1993, 2). If the road was dependable enough for our first president, then surely it was the one South Carolinians along the coast would have used. Perhaps, too, this is a reason to start calling the road “The President’s Highway” instead of the King’s Highway. For a road so important to the burgeoning nation, it’s decidedly off the beaten path today, and of course that is no doubt why it remains so well preserved. As soon as Route 40 (modern-day Highway 17) was completed in 1929, it became the primary way to travel between Charleston and Georgetown. As a Mrs. W.S. Allan wrote in her April 1930 presentation, entitled “The Kings Highway,”—a moniker that seems to have become common only in the 20th century—this new route “after the manner of modern highways, demonstrates its belief in the geometric axiom that a straight line is the shortest distance between two points, by leaving the old winding King’s Highway at times for a shortening of the road” (Allan, 1930 12). Mrs. Allan’s speech reveals something new about the Old Georgetown Road: the road, preserved and un-updated, even if rarely traveled, could serve as a means to evoke the state’s past. Her description of the route is more of a timeline than a narrative—connecting the individuals who were born at or lived in the plantations along the road and important events in South Carolina history. In her description of Eldorado plantation, for example, Mrs. Allan not only mentions it was built by General Thomas Pinckney, but she also tells the story of how Pinckney’s marriage to a daughter of Rebecca Motte connects this site to the “patriotic burning of her home at Fort Motte to prevent its falling into enemy hands” (Allan, 1930, 8). She is proud of her heritage and of the places that ignite passion for local history. In truth, Mrs. Allan captures the emotional side of heritage tourism—of connecting to the past through travel—which continued to bring people like her to the Old Georgetown Road in the first half of the 20th century. Her conclusion is full of nostalgia and love for history as she writes “But oh! For those who can sense it, the glamour of the past is still there over it all as surely as the gray moss on the age old oaks along ‘The King’s Highway’” (Allan, 1930, 18). The King’s Highway was added to the National Register of Historic Places last October. The ceremony was held at St. James Santee Episcopal Church on Oct. 19th. L-r, first row: Eric Emerson, Jessica Garrett (author), Bud Hill, Michael Prevost. Second row: The Rev. Jennie Olbrych, Drayton Hall Executive Director George W. McDaniel, Elizabeth Johnson. And it is Mrs. Allan’s conclusion that brings me back to present day, or at least near present day. 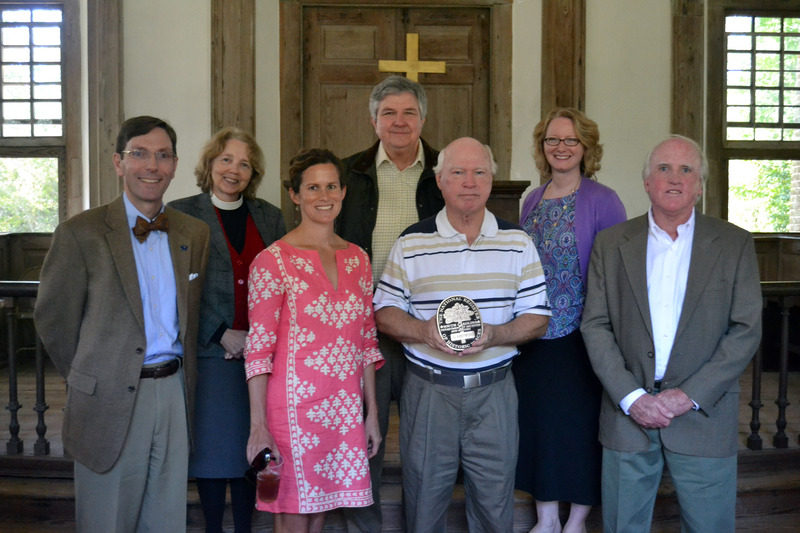 For it is was on a sunny Sunday afternoon this past fall, on October 19th, that a group of forty or so South Carolinians gathered at the St. James, Santee Episcopal Church to celebrate the addition of the Old Georgetown Road to the National Register of Historic Places. Bud Hill, Mike Prevost and George McDaniel were back together in the very place where they had first discussed how to preserve the road in perpetuity. Also at the ceremony was Eric Emerson, Director of the SC Department of Archives and History and advisory council member of the Drayton Hall Preservation Trust. Eric’s agency helped craft an application that gained approval first at the state level, eventually at the national level. Together with local residents, we commemorated the history of the Old Georgetown Road, and we celebrated its preservation. More than that, though, we reveled in the fact that because the Old Georgetown Road still looks so untouched by the passage of time, anyone who travels along it today can so very easily imagine being part of South Carolina’s past—whether walking alongside the Sewee who traded along this Broad Path, attending services with members of the Brick Church who would go on to become signers of the Declaration of Independence and the Constitution, performing reconnaissance under Francis Marion’s orders, or witnessing George Washington and his retinue passing down the road as the nation’s first president, or even perhaps traveling with Charles Drayton from Drayton Hall going to visit his daughter Charlotte and his nephew John on their plantations on or near the Santee River. Jessica Garrett served as Drayton Hall’s director of development until 2011. Today she continues to work in historic preservation and conservation as a freelance writer. She lives in Charleston with her husband and four young children. Allan, Mrs. W.S. “The King’s Highway” (lecture delivered to the Rebecca Motte Chapter of the Daughters of the American Revolution, Charleston, SC, April 12, 1930). Doar, David. A Sketch of the Agricultural Society of St. James Santee, South Carolina and an Address on the Traditions and Reminiscences of the Parish, Delivered Before Society July 4, 1907. Reprinted by the St. James Santee Historical Society. Dollarhide, William. Map Guide to American Migration Routes, 1735-1815. North Salt Lake, UT: Heritage Quest, 1997. Lipscomb, Terry W. South Carolina in 1791: George Washington’s Southern Tour. Columbia, SC: South Carolina Department of Archives and History, 1993.